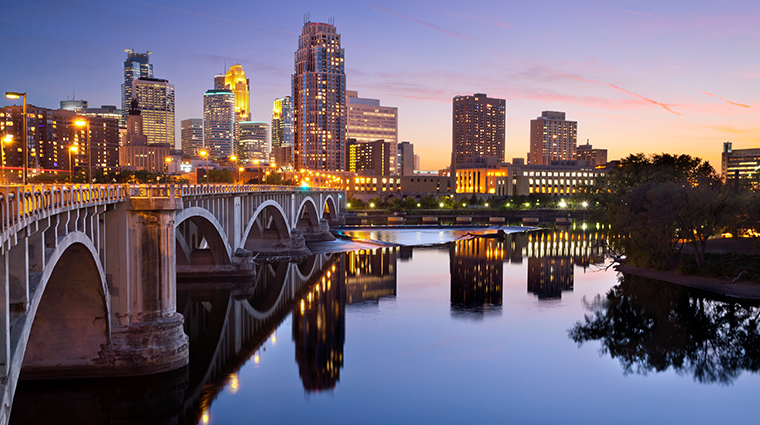 Minneapolis is fast becoming the epicenter of all things cool. A bicycle-sharing program has put the emphasis here on green commuting, while the area’s pristine chain of lakes and trails connect a vibrant, art-focused city of grand ideals and even grander architecture. These days, Minneapolis is an architecture hot spot, with unique buildings that dot the city like gleaming trophies, such as the Herzog and de Meuron-designed Walker Art Center; the Frank Gehry-designed Weisman Art Museum; the magnificent Guthrie Theater that overlooks the dancing Mississippi River; and the downtown library whose glass walls offer a large-screen view of the thriving city streets. While Minneapolis prospers on progressive concepts of mass transit and environmentalism, it doesn’t mean the city is leaving its charmingly Midwestern past behind. Instead, the city is embracing its farming and grain-mill-fueled history, turning old grain mills into things like the Mill City Museum, which not only hosts a farmers’ market dedicated to regional goods but also an education center focused on agriculture and life on the Mississippi. At the end of summer, in an annual celebration of all things ’Sotan, Minneapolitans really embrace their past, descending onto the Minnesota State Fairgrounds for a 10-day festival filled with pigs, cows, rides, cheese curds—basically everything you can shake a stick at on a stick—and overflowing local pride.